I had read about this diet some time ago and thought it sounded like a good idea with lots of health benefits, however I procrastinated about it and put it to one side. I realized that I was fearful of refraining from eating for a time. I was unsure of how my body/mind would respond. I saw how much emotional attachment I have to eating and food. So having the support of my husband to do the fast with me, made all the difference. We began in January 2016 filled with good New Year intentions. I’m finding that I’m really enjoying it and my body/mind is responding well. It’s much easier than I expected. We chose Mondays and Thursdays, and what it boils down to on those days is eating around 500 calories, although now I’m into it, I don’t count calories. I just remove the starchy carbohydrates, and on fast days I feel less hungry than on days that I do eat carbs. So what do we eat? For breakfast at around 10am, we have two eggs each scrambled plus a whole pile of green veggies sautéed in a little butter. We often have a decaf latte during the day, sometimes some carrot sticks and homemade hummus around 5pm, and at around 7pm a meal of either fish and a whole medley of green veggies, or miso soup with lots of veg and tofu. BTW I found an amazingly delicious NZ miso paste made by Urban Hippie available in health stores. The results…I lost 2-3 kilo’s in that time and 3 cm’s from around my middle. I’m feeling a lot more comfortable in my clothes and just feel good and clear headed. I only want to lose another couple of kilo’s, and will keep up the diet principles for 2 days a week on an ongoing basis. What I found is that those principles ripple out into the rest of the week, and I now prefer eating less carbs, more vegetables and drinking less alcohol. My body seems to like this approach. As a side note, I am taking whole thyroid supplement and 2 drops of Lugols iodine solution per day as my thyroid and metabolism was previously sluggish. My energy has been a lot better since taking these supplements under a GP’s guidance. It may be more difficult for those with lowered thyroid function to achieve similar results. If you have low energy and feel the cold, you could have low thyroid function – so get it checked out. I think it is really beneficial to give the body a rest from food and eat lightly for 2 days of the week. And it’s not really a true fast as you are still eating. You can choose not to eat breakfast and just have lunch and dinner, its very flexible to suit your lifestyle. I would recommend this diet for those who have some excess to lose and who are of a generally strong constitution. It would not be suitable to people who are depleted and who need to eat small amounts often to maintain their energy levels. 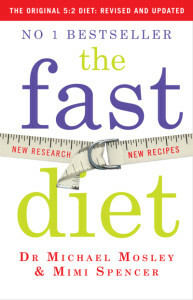 I have Michael Moseley’s e-book The Fast Diet and I’m happy to email it to anyone who is interested. It’s a good read!